Laura Rose Stephen (1866-1963) was Canada’s Dairying Queen. Until big business took over the Canadian dairying industry she had a profound influence on quality and production of dairy products. She was born at Georgetown, Ontario, daughter of Lawrence Rose, a flour mill owner and had at least one sister and five brothers. The famous “Five Roses” flour brand associated with Ogilvy and Lake of the Woods Milling Company supposedly originated with her father’s mill. [i] Rose graduated from secondary school in Guelph and kept house for one of her brothers in North Dakota where she also taught school. [ii] When she returned to Canada, she attended the Ontario Agricultural College in Guelph and was one of the first female graduates from the OAC dairying course in 1893. This was a field in which she was particularly adept and she quickly became the OAC Dairying Instructor. For the next fourteen years she instructed Dairy Butter and Cheesemaking and wrote a 300-page text, “Farm Dairying”. 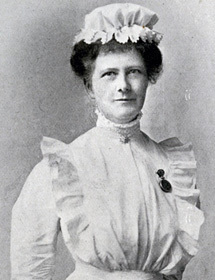 At OAC she also worked with Adelaide Hoodless, founder of the Women’s Institute and became involved in establishing WIs throughout Canada, including 15 in BC in 1909. Rose’s promotion of sanitary procedures in dairying might have resonated with Hoodless, whose loss of a young child to milk-fever was a major motivation for her life’s work. Laura Rose was an intrepid traveller; she spent summers in Europe and established a legendary Travelling Dairy” that went around Nova Scotia in 1901 and 1902. She drove a horse and buggy and delivered dairying knowledge to farmers’ wives first around Cape Breton and then on the eastern side of Nova Scotia. Her work contributed to the improvement of standards of milk and cream production and made more practicable the establishment of factories for dairy products. At the age of 45 she married and adopted two children. There were many social and cultural implications with Rose’s work. As related in a previous blog, milk production on small farms was a major source of income for women. This diminished greatly with the transfer of dairying from the farm to factories. In “The Decline of Women in Canadian Dairying”, [iii] Marjorie Griffin Cohen makes the argument that this was due to the patriarchal structure of the household. Women were not considered able to handle money; the farms were generally owned by their husbands. This must have been ironic for the women who ran households on very little cash, and whose families had relied on the cream cheque for items that had to be store-bought. Dissolve the soda in boiling water and pour over fat and sugar. Add salt and vanilla and mix until creamy consistency. Add rolled oats and flour. Put on cookie sheet by teaspoons and flatten with a fork dipped in cold water. These cookies are made more attractive if pressed large and thin and cooked to a golden brown in an oven of 350 degrees F.
[iii] Cohen, M. G. (1984). The decline of women in Canadian dairying. History sociale – Social History, 17 (34), 307-34. Ambrose, L. M., & Jensen, J. M. (Eds.). (2017). Women in agriculture: Professionalizing rural life in North America and Europe, 1880-1965. University of Iowa Press.